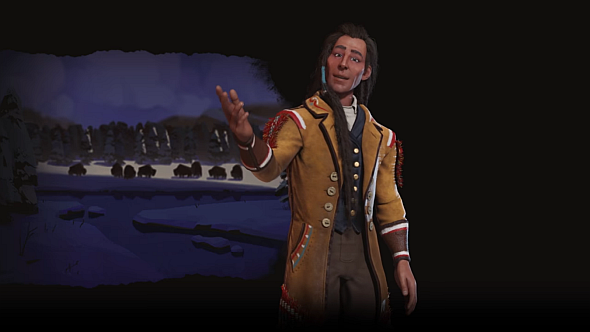 Civilization VI gets its first Native (North) American civ with the Cree, who are today one of the largest groups of First Nations in North America. They are led by Poundmaker, a chief of the Plains Cree who lived in the mid-19th century and worked hard to make peace with the Canadian government. Here’s everything we know about Civ 6: Rise and Fall so far. Poundmaker’s leader ability, Favourable Terms, will cause all alliances to grant shared visibility. When trading with foreign cities, camps and pastures in that city will provide additional food for the Cree, and additional gold for their trade partner. The Cree unique ability is Nihithaw, which grants a free trader unit when you discover pottery. Additionally, when a trader enters an unclaimed tile within three tiles of a Cree city, it will claim that tile for your empire. The Cree also have a unique tile improvement, the Mekewap, which provides housing and production. When adjacent to luxury resources, it also provides gold, and food when adjacent to bonus resources. The Cree unique unit is the Okihtcitaw, which roughly translates to ‘warrior’. They replace scouts, and get a free promotion and increased combat strength. The Cree look like fun, and are clearly designed to encourage aggressive exploration and settling in the early game. Civ VI: Rise and Fall is due on February 8, and will cost $29.99, €29.99, or £24.99. Here’s the Steam page.